The Chevy Silverado has plenty of room for customization and the wheels are the best place to start. Installing a new set of wheels will not only give your truck a distinctive customized look but also improve its performance and driving capabilities. 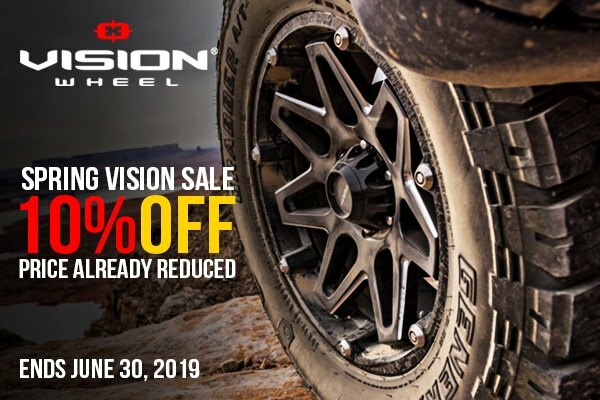 Vision has been in the industry for over 40 years and today offers a wide selection of custom off-road wheels you can count on. They feature high-quality, durable aluminum or steel one-piece construction, removable center cap with the Vision Off-Road logo and the ability to handle the most extreme environments. Today we are here with our Spring Sale on Vision Wheels! Purchase Vision wheels from CARiD and save 10% OFF the original price. Shop now! The promotion ends on June 30, 2019. Prices are already reduced.